When will Vanity Fair open their Best-Dressed List to include tiny tykes? They're better coiffed and clothed than their celebrity parents most of the time! 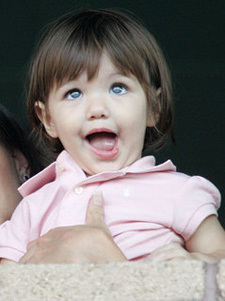 Take Suri Cruise, for example. While mom Katie's been making the scene in those scary mom jeans (oh sorry, "boyfriend" jeans -- which we hate, hate, hate! ), baby TomKat has been having her very own junior fashion parade around NYC this summer. This makes us wonder -- do we have a bona fide Luxaholic-in-Training (L.I.T.)? We think so! Not only does Suri dine at Nobu donned in duds from super upscale kiddie boutique, Bonpoint, but the little posh tot also struts her stuff in Juicy, Splendid and Jacadi. It's never too early to start luxe-ing it up.